The advent of Web 2.0 technologies in recent years has prompted a shift in academic practices, the openness and networked participation afforded by such tools leading to the emergence of what has been dubbed ‘the digital scholar’ (Weller, 2011). Technologies such as social media, blogging platforms, and collaborative writing software have provided digital scholars with unprecedented access to synchronous collaboration and real-time feedback, with vast networks of peers facilitating a constant process of creating, sharing, commenting and revision (Yamamoto and Karaman, 2011). As Higher Education institutions begin to adopt such practices, and Web 2.0 tools are increasingly ‘becoming popular in teaching and learning environments’ (Brodahl and Hadjerrouit, 2011), notions of what it means to be a learner are in a state of transformation. Digital tools have the potential to support learning in ever more innovative ways, ‘mark[ing] a step change in the ways in which learners can interact with and on the web’ (Selwyn, 2008), and encouraging a pedagogy that is open, participatory, and collaborative. The educational landscape is evolving, shaped, in part, by the digital scholar. This has implications for the Secondary School Teacher, who is expected to ‘demonstrate a critical understanding of developments in the subject and curriculum areas, and promote the value of scholarship’ (Department for Education, 2011). As the definition of ‘scholarship’ changes to include the practices and pedagogies of digital scholarship, and more school-leavers than ever before are going on to study at university (UCAS, 2016), teachers have a responsibility to ensure that their learners – the digital scholars of tomorrow - are adequately prepared in the tools and practices used in Higher Education and beyond. Many teachers are keen to embrace this responsibility, and there is evidence from the UK (Penney, 2017) and beyond (Woodrich and Fan, 2017) that some secondary institutions are already making innovative use of Web 2.0 tools to further open and collaborative teaching methods. Despite this, there remain barriers to ensuring that tomorrow’s digital scholars are adequately prepared, including school cultures that discourage risk, a lack of confidence with Web 2.0 technologies amongst staff, and the absence of a support network to exchange ideas and to share examples of best practice (Kirkland and Sutch, 2009). The conference presentation will demonstrate how a short multimedia course is being designed to negotiate some of these barriers. Aimed at the Secondary English teacher, who is ideally placed to promote the creative and collaborative practices of digital scholarship, the online course uses the open-source Learning Management System, Canvas, to demonstrate how Google Docs can be used effectively in the classroom for collaborative writing. 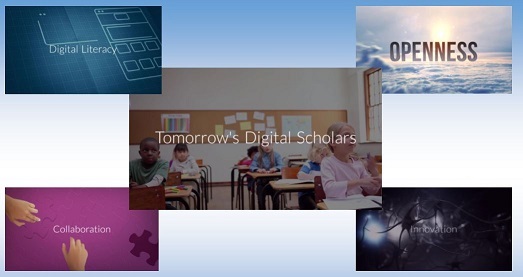 Providing not only a guide to using Google Docs to promote collaborative writing, but a virtual environment for colleagues to exchange innovative examples of best practice, the course will offer one of many possible ways in which Secondary practitioners can nurture the skills of tomorrow’s digital scholar. Brodahl, C. and Hadjerrouit, S. (2011) ‘Collaborative Writing with Web 2.0 Technologies: Education Students’ Perceptions,’ Journal of Information Technology Education, vol. 10, pp. 1–31 [Online]. Available at https://brage.bibsys.no/xmlui/bitstream/handle/11250/138167/Brodahl_2011_Collaborative.pdf?sequence=1&isAllowed=y (Accessed 21 November 2017). Department for Education (2011) Teachers’ Standards Guidance for school leaders, school staff and governing bodies, [Online]. Available at https://www.gov.uk/government/uploads/system/uploads/attachment_data/file/301107/Teachers__Standards.pdf (Accessed 10 November 2017). Kirkland, K. and Sutch, D. (2009) ‘Overcoming the barriers to educational innovation A literature review’, [Online]. Available at www.futurelab.org.uk (Accessed 28 November 2017). Penney, S. (2017) ‘Open Scholarship,’ education2017, 10 October [blog] Available at https://education17blog.wordpress.com/ (Accessed 16 November 2017). Selwyn, N. (2008) ‘Education 2.0? Designing the web for teaching and learning,’ Epsrc, vol. 20, no. October, pp. 162–165 [Online]. Available at http://www.tlrp.org/tel/files/2008/11/tel_comm_final.pdf (Accessed 10 November 2017). UCAS (2016) Record numbers of 18 year olds accepted to university this year, UCAS report shows | Undergraduate | UCAS [Online]. Available at https://www.ucas.com/corporate/news-and-key-documents/news/record-numbers-18-year-olds-accepted-university-year-ucas-report-shows (Accessed 5 December 2017). Weller, M. (2011) The Digital Scholar - How Technology Is Transforming Scholarly Practice, Boomsbury Open Access [Online]. DOI: 10.5040/9781849666275.ch-001 (Accessed 15 June 2017). Woodrich, M. and Fan, Y. (2017) ‘GOOGLE DOCS AS A TOOL FOR COLLABORATIVE WRITING IN THE MIDDLE SCHOOL CLASSROOM,’ Journal of Information Technology Education: Research, vol. 16, no. 16, pp. 391–410 [Online]. Available at http://www.informingscience.org/Publications/3870 (Accessed 19 November 2017). Yamamoto, G. T. and Karaman, F. (2011) ‘On the Horizon Education 2.0’, On the Horizon, vol. 1910748121111138300, no. 2, pp. 109–117 [Online]. Available at https://doi.org/10.1108/10748121111138308 (Accessed 2 August 2017).